Managing a revenue cycle in the medical field is no easy task. Below are some concerns for orthopedic practices and recommendations for monitoring the health of your revenue cycle. Too many days are focused on accounts receivable. When you look at your billing patterns, there should not be inconsistencies with the dollar volume of charges being posted on a daily basis. There is a consistency in the timeliness of charges being turned in. In this case, you should be employing a series of management reports to look at on a daily basis, examining not only the number of claims, but dollar values as well to check for any irregularities. Your orthopedic practice should also be examining the positive trends as well as rejected claim information that comes in on a daily basis. If you are only tracking dollar volume rather than trends, you are missing more than half of the key elements of information. Your practice must understand the trends of why claims are being rejected, but also pay close attention to the trending number of days outstanding. By checking on a monthly basis, you’re in a better position to act quickly when you see a red flag. One element that is often overlooked is charge capture, which is the capture of information for use in a medical claim document. It’s a critical component of the overall revenue cycle. Without a reliable charge capture process, poor coding and lost charges can cost your practice a significant amount of money. Currently, if payments and cases are not being reconciled daily andif there’s not reconciliation in place, charges and therefore revenues are being lost. One solution is to implement standard operating procedures, getting everyone in your practice to use the same charge form for hospital visits, ER visits, office visits, and consultations. Another is entering surgeries into your practice management system in order to create reconciliation reports to account for al the surgeries that are being generated. The timeliness of when physicians generate a surgery to the time it actually gets to billing has an effect on your cash flow and profitability in your orthopedic practice. Hold your physicians responsible for complying with the billing procedures set in place. Physicians in your practice should submit their surgical charges no later than five days after a surgery is performed. Failure to comply should result in their paycheck being held until compliance is achieved. Durable Medical Equipment (DME) is always a challenge. If you effectively manage DME it will add to the profitability of your practice, but for the most part patients are not getting charged for durable medical equipment correctly. In order to prevent this, your practice should be tracking the DME revenue and comparing it to the direct expense paid to the vendor for the supplies. Managing your inventory and controlling the dispensing of your DME can increase your practice's profitability. On the billing side for DME, if you do not have an Advance Beneficiary Notice (ABN) for patients to sign when they walk in the door, you are essentially giving that product away for free. It’s essential to make sure that an ABN is a part of your overall registration packet so that patients are signing it and you’ve got it in hand. Aggressively managing denials and rejections are essential to ensuring a strong revenue cycle management. Managing insurance denials effectively and appropriately can be often be neglected because of a lack of dedicated resources, especially in smaller offices or in house billing staff. Typically the number one reason for a claim to be rejected is human resource related. Either the front office staff did not get all the necessary information needed, or it was entered incorrectly into the information system – causing the initial rejection. The best way to avoid this is training your staff thoroughly, ensuring that they are current with the policy for avoiding and managing rejections and denials. Most importantly, make sure they know what the percentage of the denials is and what causes the denials. This is important for accountability,tracking, and trending purposes. One of the greatest challenges of managing the orthopedic revenue cycle is having limited resources. Generally, the strategy for managing revenue cycle with limited resources is to focus on larger balances. The issue with this is over a period of time when you look at a report that shows multiple small balances, it can add up to a much larger sum equally tens of thousands of dollars in lost revenue. As a solution, focus the appropriate number of resources to work the small balances, which will result in a significant reduction in outstanding balances. If you let the claims sit, and then one day decide to send them off to be claimed, the chances of collecting those are low with a much higher level of difficulty impacting negatively the cost to collect. Having someone on your team look at the under one hundred dollar claims is vital, and an extremely important part of managing your orthopedic practice’s revenue cycle. The key to building a successful orthopedic practice is excellent communication throughout the organization. It’s essential as a leader in your practice to make sure that directors, managers, and supervisors are all making their self available to listen to their staff and openly communicate. Ask you staff questions on what’s working, what’s not working, and if there is something that needs to be replaced. Keeping everyone in the office aware of what activities and initiatives are on the horizon promotes high moral and a good communication platform. This is essential to building a positive work environment. This can also make the practice’s revenue cycle process much more efficient with potentially avoiding surprises or uncommunicated issues, problems, or changes. .
A huge concern for orthopedic practices is physicians not being involved in the revenue cycle. Physician’s involvement is very important. It’s essential to have one or two physicians act as a physician liaison on behalf of the practice to spend an hour a month with the appropriate people to discuss what’s occurring within the office related to the management of the revenue cycle. In order for this to work, you need to educate your physicians on the revenue cycle process and the challenges involved. Educating your physicians, and having them understand realistic expectations, brings credibility and adds to the effectiveness of managing your practice’s revenue cycle. 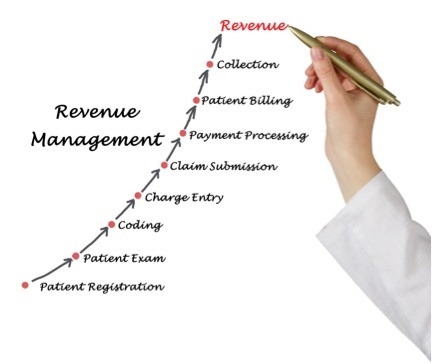 Successful revenue cycle management is an important part of running your orthopedic practice. At HIS, we control and manage your practice’s revenue cycle process to ensure your practice collects all the funds owed for the services you provide. By outsourcing the management of your revenue cycle to HIS, you will not only minimize billing errors and staffing issues that cost your orthopedic practice money, but will also see an increase in cash-flow, maximized reimbursements, and increased profitability. Contact us today for more information on our revenue cycle management services!